Timothy Gwyn is the pen name of Tim Armstrong, a professional pilot in Kenora, Ontario. The child of an oceanographer and a biology teacher, he moved around a lot as a youngster, living on three continents before graduating from high school by correspondence from Australia. Too lazy for university, he started flying lessons at the age of eighteen and, apart from stints as a lifeguard and a radio announcer, has been a pilot ever since. 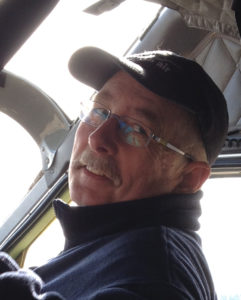 For summer residents of Kenora, he operates Lake of the Woods Ice Patrol, a website with aerial photographs and updates on the annual spring thaw. As a writer, he has had a couple of short stories published in his twenties, and then took a long hiatus before trying to learn the craft properly. His first recent publication was in Antipodean SF, and led to a string of narrations for their podcasts. 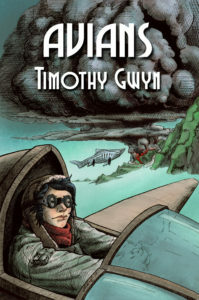 Tim is fascinated by alternative aviation, and a desire to mash together gliders and airships led to the creation of a whole world, some short stories and at least one novel. And speaking of novels, his first, Avians, releases from Five Rivers August 1, 2017 and is sure to please YA readers.